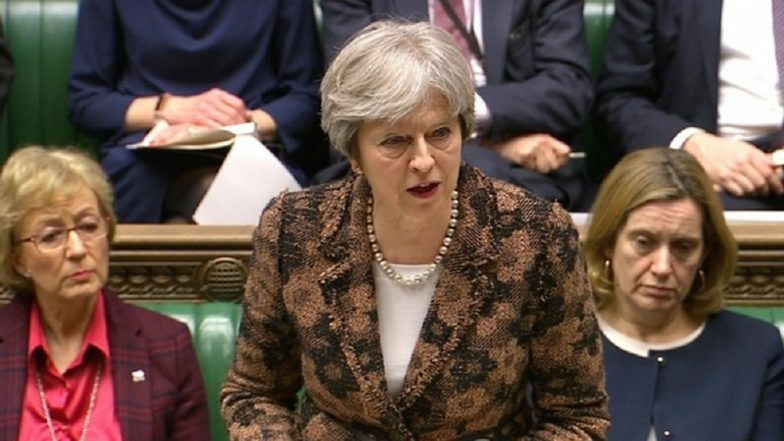 London, March 27: The political heat in British Parliament in London is most likely to rise, as Prime Minister Theresa May stated on Wednesday that she would quit if her twice-defeated EU divorce deal passes at the third attempt, reports Reuters. This is seen as a last-ditch attempt to persuade rebels in the Conservative party to back her, opined a lawmaker in her party. Keeping the movement of the politics in the United Kingdom sceptical on Brexit deal, the lawmaker pointed out that the PM May ‘would go if deal gets through’, adding that May will have to walk out of the top chair’s office. Though the dates are not finalised as of yet, Conservative lawmakers are hopeful that the decision would come ‘reasonably soon’. British PM Theresa May on Third Brexit Vote, Says ‘Parliament Support Not Sufficient’. It is to be known that with United Kingdom’s three-year Brexit crisis in continual, the incumbent PM May has faced criticism with persuading lawmakers to support her move to part ways with the European Union. Some Conservative rebels had made it clear that they would only consider supporting May’s deal, provided she gave a firm commitment and date for her resignation. Earlier, PM May had promised to step down before the next election – due in 2022. Now considering to bowing down by rebel Conservative lawmakers demands, chances are high that her EU deal might pass before the new April 12 deadline in the Parliament. As the plans are in place, the UK government is trying to bring the deal back to parliament for a third vote on Friday. According to PM May’s deal, Britain will leave the EU single market and customs union as well as EU political bodies. But before that EU rules need to be applied which states that no border is rebuilt between British-ruled Northern Ireland and EU member Ireland. Since Conservative rebels have objected to this so-called Irish backstop, things are most likely to a drastic turn. Earlier, May’s deal was defeated in parliament by 149 votes on March 12 and by 230 votes on January 15.